We went through 20 different products and decided on the 5 best essential oils for acne prone skin you should try based on their properties, ability to halt your skin breakouts and reduce acne scars. These best essential oils should be able to help heal any existing acne you have while preventing future breakouts. ArtNaturals Organic Jojoba Oil is 100% natural. It’s chemical-free which makes it safe enough to use on your skin. The nice thing about this jojoba oil is that it isn’t only great for clearing your pores from pollutants and dirt, but it can also moisturize your skin at the same time. And you won’t have to worry about feeling greasy after applying the oil on your skin as ArtNaturals Organic Jojoba Oil gets absorbed into the skin really well. Consumers felt no stickiness or tackiness after application. The product comes in a generous amount of 4 oz. You get a glass dropper with the bottle for dispensing. The product’s packaging isn’t too well-received by its customers. Aside from a few people receiving their oil bottles with faulty droppers, there are also consumers who dislike that the dropper comes with a rubber teat as its lid. They feel that a separate cap would be more appropriate since rubber can degrade easily. Although jojoba oil doesn’t get rancid on its own, you have to be conscious of where you place your bottle. If water gets inside it, there’s a good chance for molds to form. How can water get inside the bottle? Well, there’s condensation. Another possible way is when water leaks inside it when you shower. When you have acne-prone and oily skin, your sebum production is higher than the average. This excess oil clogs the pores and causes acne. Excess oil production is often triggered by the frequent changes in the product you use- in your attempt to end your breakouts. This sends the wrong signal and your skin begins to think that there’s not enough oil to protect it. Jojoba oil is known to have a similar property to the human sebum. Because they appear similar, applying it on your skin can trick it to sense that the amount of sebum on its superficial layer is already enough. Hence, you get oil control. Aside from this property, jojoba oil also has astringent, antibacterial and anti-inflammatory properties to resolve your acne issues. 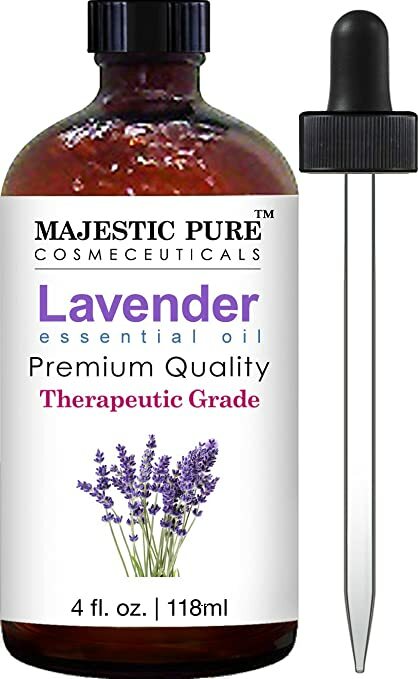 Majestic Pure Lavender Essential Oil is therapeutic grade. It doesn’t contain any fillers which means you get pure lavender oil goodness. It carries a nice aroma that’s relaxing, too. It can soothe your stress and anxiety while addressing your skin issues, such as your skin breakouts. There are, however, a few people who didn’t find the scent appealing. They claimed that the product’s aroma is too strong- even strange for some. A little goes a long way. But, because it is potent, it’s recommended that you use a carrier oil with it. A lot of people prefer coconut oil. The product has a large 4-ounce size. It comes in an amber-tinted bottle which is helpful in prolonging the shelf life of the product. Lavender oil has the ability fight bad microorganisms while soothing your skin. It’s also packed with antioxidant properties, which means that it can heal your face acne and reduce your acne scars. On top of these properties, the oil also has stress-relieving properties. If your breakouts are triggered by too much stress, then lavender oil is one of your best solutions. Living Pure Lemon Essential Oil comes in a 15mL dark amber tinted bottle. It’s therapeutic grade which means that it’s pure and effective. Although small in size, the essential oil is actually strong. This means that a little amount can go a long way. A lot of people like how refreshing its scent is. They actually find it relaxing and rejuvenating at the same time. As for dispensing, it comes with no dispenser syringe. You have to use its dropper top to get the product from the bottle. For skin care, some people mix it with their face masks. They experience blemish and acne-free skin from it. Aside from your skin and acne, this essential oil actually has a lot of uses. You can use it for cleaning, aromatherapy and in doing your laundry. One important thing to remember, however, is that it should never be ingested. Lemon oil is one of the best essential oils you can use for your face acne. It has antibacterial property to get rid of your present pimple while preventing future breakouts. The oil also has a mild astringent property to provide mild exfoliation. It can shed off dead skin cells while lifting off dirt and excess oil clogging your pores. On top of these benefits, lemon also has a rich vitamin C content which can fight free radicals and diminish acne scars. 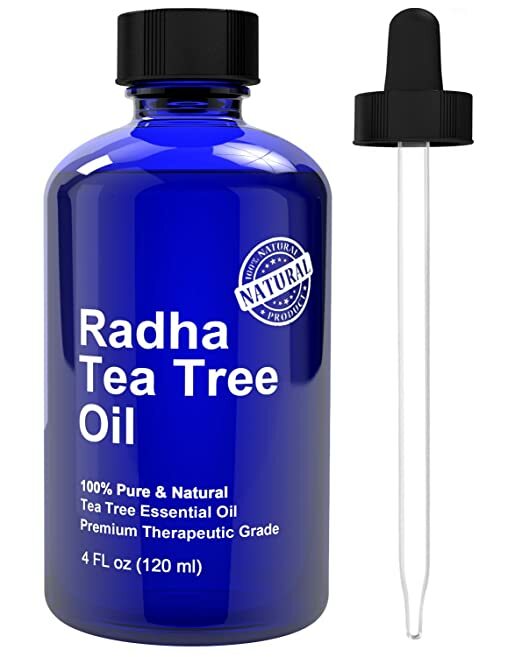 Radha Tea Tree Oil comes in a beautiful deep blue tinted bottle. 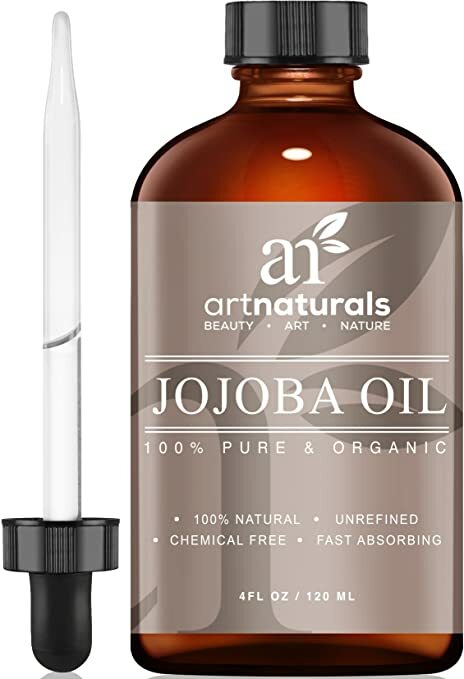 Unlike ArtNatural’s Jojoba Oil, this product comes with a regular cap. You get a separate dropper lid, which you can use for dispensing the oil. This tea tree oil works well on acne. One particular user suffered from a sudden breakout around her chin area due to stress. After applying the oil, she saw a great reduction in the redness and size of her pimples the very next day. Although some spots were still visible, she was glad that her actual breakouts became less noticeable. Radha’s Tea Tree Oil comes with a strong scent, which is something you have to keep in mind in case you have an extra sensitive nose. The product can be harsh as well, so make sure you’re not using it on highly delicate skin. Even the best tea tree oil for acne can cause adverse reactions when used improperly. When using the product, consider taking a small amount first. Aside from that a little goes a long way, too much tea tree oil can also cause burning, irritation and excessive dryness to your skin. Tea tree oil has potent antibacterial properties. It’s great in eliminating the acne-causing bacteria on your skin, particularly Propionibacterium Acnes. And not only that. It’s even effective in killing MRSA or the Methicillin-resistant Staphylococcus Aureus bacteria that are not responsive to most antibiotics. Aside from its antimicrobial properties, tea tree oil can also soothe the inflammation and itching that comes with acne breakouts. Tea tree oil isn’t only good to use on acne. In fact, it’s also considered as one of the best oils for acne scars. If you’re finding this oil too strong to use, you can dilute it with a carrier oil. Coconut oil is one of your best options. One thing you’d notice right away with the product is its crisp and refreshing scent. Most users tell that its fragrance is literally almost the same as a real grapefruit. Aside from its fragrance, they also liked that it’s reasonably priced. You get 30mL of product for its affordable price. It’s great for controlling oil and can be mixed with lotions and creams for that extra energy boost during the day. One particular user added it to her moisturizer and successfully treated her acne. One key thing to remember with grapefruit essential oil is that it causes photosensitivity. If you’re planning on hitting the beach, make sure to avoid using the oil as it can cause sunburn. It’s best if you can use it at night or wear sun protection after its application if you know you’ll be exposed to sunlight. Similar to the other essential oils in this list, grapefruit oil also has antibacterial properties. It’s even great in controlling excess oil, which is one of the most common culprits of clogged pores and acne. The oil also has the ability to boost your skin’s immunity. When it is healthier, your skin becomes more resistant to infections and breakouts. And that’s what we want, right? Grapefruit essential oil, despite its potential for increased photosensitivity, can also facilitate wound healing and protection against pollution. Essential oils are liquids generally extracted from plants’ roots, flowers or leaves. As they are extracted, these oils carry the properties of the plants in which they were derived from. Essential oils are different from the fragrance oil people use as perfume. Fragrance oils are typically created synthetically to produce the same scents as essential oils. Since they are considered as artificial reproduction, they don’t have the same therapeutic benefits you can find in essential oils. Why Should You Use Essential Oils for Acne? I know the idea might make you cringe. But, hold your thoughts right there. Although the idea of applying oil on your already oily face can sound counterintuitive, or even absurd, it’s actually a better solution. Here’s why. If you’re going to visit a dermatologist, you should prepare at least $150 to $200 per visit. This price can go up or down, depending on how much your dermatologist actually charges. Now, consider all the anti-acne products you’re using. If you add up all of their costs, you’ll likely find yourself spending a few more hundreds. In comparison, you can buy a bottle of quality essential oil for only a fraction of the cost of all your anti-acne products and dermatologist visits. Plus, you only need a small amount of the oil. One bottle can practically last you a long time. Not all essential oils are created in the same way. If you want the best one for your skin, you should look for the product’s purity. Making sure that you only buy 100% pure essential oil can help you get the benefits you are looking for. The great thing about essential oils is that you don’t actually need to stop using your current anti-acne products for them. You can choose to use both approaches in ending your struggles with breakouts and pimples. However, before you decide on any of this, make sure that you consult your dermatologist first, in case you are seeing one. If you aren’t, then do proper research to know if your essential oil of choice has any negative effects on the products you are using. On top of research, it’s also a good idea to do a sensitivity patch test first to see if there’ll be any adverse reactions. Take 2 to 3 tablespoons of your essential oil and mix it well with yogurt. Your best option for this face mask is natural yogurt. Apply the mixture on your face and leave for around 15 minutes before rinsing off. Generally, you need 1 drop of essential oil for every tablespoon of moisturizer. You can create this mixture in a separate container if you don’t want to keep repeating the procedure every time you need to apply it on your skin. In case you’re dealing with a bad case of breakouts and you have large painful zits, you can use essential oils to bring down the inflammation and pain. Tea tree oil is one of the best essential oils you can use for this type of acne. Simply take a bowl of water and around 4 drops of the essential oil to it. Use a piece of cloth or cotton ball and soak it in the water. Take out the excess water and apply it on the affected area. Hold it in place for at least 10 minutes. Finding the right essential oil for your face acne is tricky, particularly since there are tons of options out there. However, in looking for the best oil for your skin issue, it’s a good idea to do your research beforehand. Aside from their actual, you should also know what brand has the highest quality oils. For this roundup, we’re picking ArtNaturals Jojoba Essential Oil as our best essential oil for acne-prone skin. It has astringent and anti-inflammatory properties which are exactly what you need to tone down your breakouts. Plus, it can control excess oil production, too. Once added properly to your skincare routine, it can keep both oiliness and clogged pores at bay.